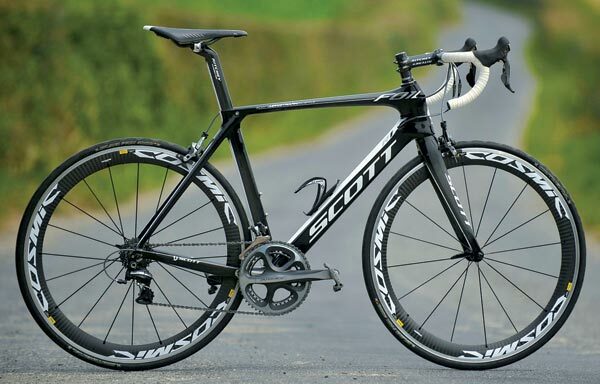 When Scott decided to enter the aero bike arena, it had some different design parameters to many other manufacturers: the bike would have to be a stiff as their current race machine, the Addict, and within five per cent of its weight – as well as being very, very slippery. Traditionally aero bikes use NACA (the American National Advisory Committee for Aeronautics) aerofoil shapes. The problem here is that the narrow shapes aren’t a stiff as standard oversize tubing. To counteract this, thicker walls are used to resist some of the loads. The result? Heavier, flexier bikes. So Scott turned to Simon Smart. The ex-F1 aerodynamicist has come up against similar problems when trying to improve the performance and airflow around the suspension struts on Red Bull Racing’s cars. Truncated aerofoils are not new – Trek uses a similar design (a Kamm tail) on its Speed Concept TT bike but rather than simply slice the rear section off an aerofoil, Smart had found out in his previous life that the rear curvature, and its changing transition had a huge impact on the air’s ability to mimic a full aerofoil’s shape. Thanks to his exclusive access to the Mercedes Petronas GP wind tunnel, he was able to research tubing shapes across the differing dimensions needed for various applications on the frame. The resultant tubes use effective aerofoils with profiles ranging from three-to-one up to 11-to-one, all staying within the UCI’s limit of three-to-one for any bicycle component. In fact, the torsional-load-resisting top and down tubes are three-to-two. The result is a supremely stiff structure that, according to Scott’s data, is within a gnat’s of the aero market leaders. With one part complete, it could go about finalising the lay-up to maintain self-imposed stiffness numbers. Scott didn’t only match the Addict’s figures, the Foil is actually stiffer at both the head tube and bottom bracket. Two out of three wouldn’t be bad, but thanks to fastidious attention to detail, the weight element was knocked into submission. Miniscule 17g full-carbon dropouts with shorter tubing overlap saved nearly 40g, carbon BB and headset bearing inserts a few more and improvements in the Integrated Moulding Process reduced internal joint material by 11 per cent. The use of proprietary high-modulus fibres (HMX) allow stiffness to be added without excess bulk and the Naked External Tubing (NET) does away with a final cosmetic layer to save more weight. The result: an 840g finished frame weight compared to 790g from the Addict. Hanging a full Dura-Ace groupset off such a frame and rolling it on Mavic’s all-rounder Cosmic Carbone SL wheels would seem to be the makings of an exceptionally good bike, then. The stiffness numbers, low mass and wind tunnel data are all well and good but, as ever, the truth will always out.